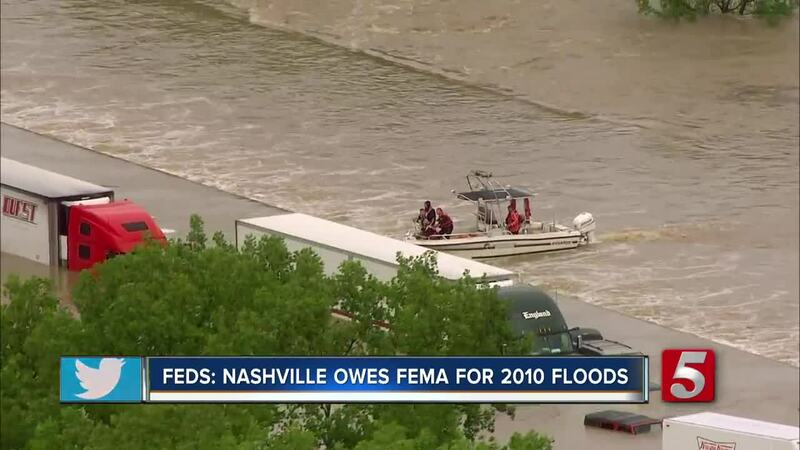 A report from the Office of Inspector General says Nashville-Davidson County owes the Federal Emergency Management Agency $413,074 in grant money from the 2010 flood. The floods that hit middle Tennessee on May 1, 2010 were especially destructive in Davidson County. The city estimated that it cost the city and its residents $1.5 billion. Nashville was declared a federal disaster area just three days after the rivers first started rising. According to the report , The Tennessee Emergency Management Agency (TEMA) did not ensure Nashville-Davidson County always accounted for and expended grant funds according to FEMA guidelines. The audit showed that the county did not always follow regulations and guidelines when spending the funds. Therefore, the report says FEMA should disallow $413,074 in project costs. The costs consist of $402,552 in contract charges not supported by adequate documentation and $10,522 in duplicate costs. Additionally, FEMA has not finished reviewing insurance proceeds and allocating them to the County’s projects although doing so could reduce FEMA’s project costs under this grant. FEMA officials agreed with the Inspector General's recommendation and filed a written response. TEMA director, Patrick Sheehan, responded to the report this afternoon, stating that TEMA would be reviewing the findings of the federal report. He went on to say, "While the federal report is not an audit of TEMA, we take the report’s results seriously and will always work effectively to manage and improve Tennessee’s recovery from disasters." "Recommendation #1 is made directly to FEMA, we have no comment on it. Recommendation #2 allows us an opportunity to review for additional documentation and we will do so. Recommendation #3 we agree with. Recommendation #4 is a FEMA activity to complete and we have no comment on it."